Imogen Harvey-Lewis describes herself as a drawaholic. She says: "My personal drawing is focused around the human condition. Each drawing pretty much a self-portrait of the everyman, feeling their feelings, expressing their emotions, being real. Harvey-Lewis specialises in capturing the nuances of body language, situation and emotion, and translates these into a strong graphic art with impeccable line work, strong composition and innate playfulness. © If artwork shown on ArtFair is already sold or unavailable for immediate sale, we'll do our utmost to source a similar edition for you. ArtFair is a trading name of LeadFair Ltd. Co. Reg. Number 08565869. Reg. Address: Swift House, 18 Hoffmans Way, Chelmsford, Essex. CM1 1GU. Registered in England and Wales. VAT Reg. No. 169725662. Registered with the Information Commissioner's Office: Data Protection Reg. No. ZA025012. Artwork prices can go up or down. ArtFair offers fine art, contemporary art, urban art, pop art, and modern art through our own collection and our global network of art gallery partners, art dealers and private collections. 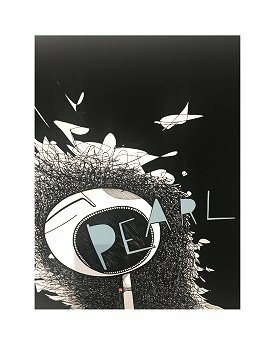 Keywords: Imogen Harvey-Lewis Art For Sale, Pearl, Pearl the Singer, Pearl's a Singer, Imogen Harvey-Lewis.